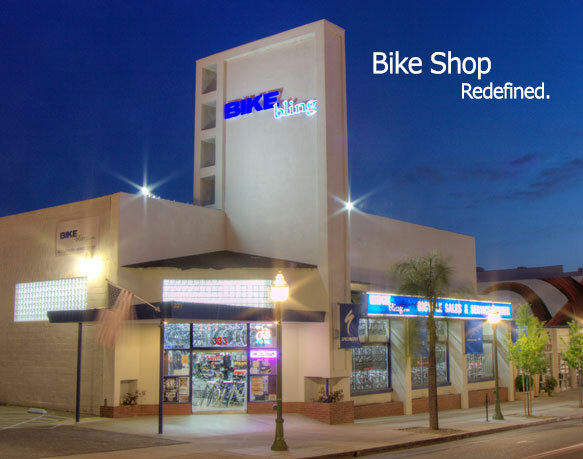 Bike bling is the San Diego regionâ€™s largest full service bicycle shopping experience located in Escondido, California in San Diegoâ€™s North County. Founded in 2008 as a web based company with a full service retail store, we are proud to have grown to become among the top tier of bicycle web companies servicing the United States and international online markets. Through our grass roots bike shop beginnings our dedicated group of cyclists have taken the same commitment of providing superb customer service and the ability to deliver quality bikes and gear from beyond our region to around the world! We pride ourselves in carrying the largest selection of quality bicycle gear to meet the needs of the beginning cyclist to the avid enthusiast. At Bike bling you can talk to any of our cycling experts and mechanics on the phone, communicate through live chat or at sales@bikebling.com for immediate answers to any of your cycling questions. We hope that you will find our real bike shop experience and full service strategy applied to our online presence to be the breath of fresh air that we intend it to be. Where does one buy a bike online? From a bike shop! Bikebling.com has turned this 1950's era ten thousand sq. foot supermarket in to a full service bicycle supermarket! Visit this one of a kind shopping experience to view the best the bicycle industry has to offer and enjoy expert service and California's largest single showroom inventory at web competitive pricing. Come see over 600 built bikes on the floor and by far the nation's largest selection of men's and women's clothing, helmets, shoes, nutrition and in-stock components for your Road, Mountain and Triathlon cycling needs. Come see our selection of Hybrids, Commuters, Cruisers, Electic, Fixies and Kids bikes too! Bikebling.com offers their everyday low web pricing in the showroom open from 10-7 Monday - Friday and 10-5 Saturday and Sunday. You can also set up your will call orders online! San Diego region please call 760-317-5450.